This feature is near the Snake/Bird rock formation and is clearly visible from space. Is it really a ground painting? Ground Painting make by Manuel Lachuso, an old man of Santa Ysabel. He had forgotten the precise location of the milky way, sun, new moon, and old moon, so they are omitted. He made no mention of toloache morters. Atoloi, with mountain on an island, identified by the informant with Coronado Island. Myapukxauna, mountain where people were created. Xawitai, grass or blue garter snake. Amu, mountain sheep, tree stars of Orion. Spitting Hole, diamter of about 8 inches. Horizon, forming the visible limits of the earth. 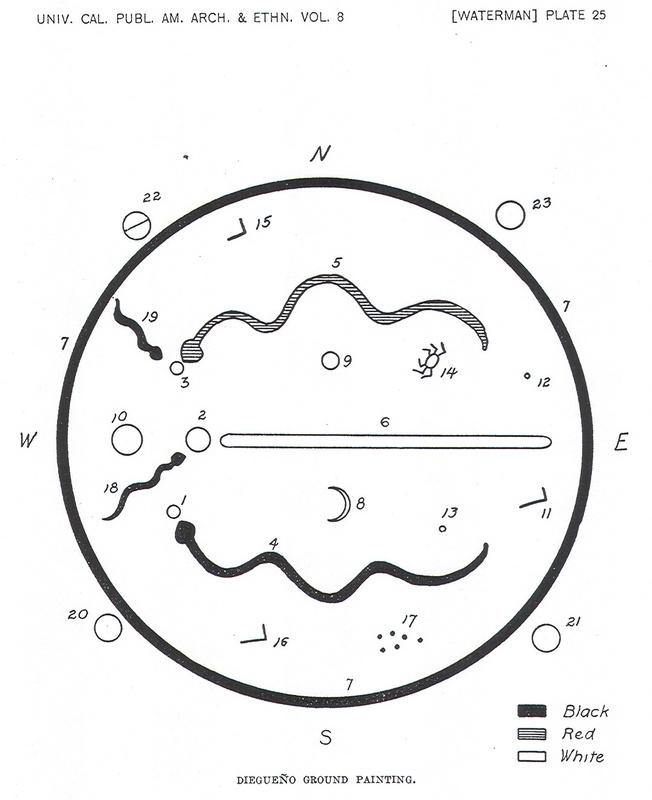 Here is a description of a ground painting, from Spier: Southern Diegueno Customs, Pg. 319. It recounts the experiences of a boy after drinking Jimson weed tea. The references do not correspond to the figure above, but gives you a sense of what is normally in the ground painting. Two days after drinking, when I recovered, they led me in the daytime from the shade to the dance ground in order to show me the ground painting. First my entire body was painted with black charcoal, then placing a morsel of salt meat in their mouths, they blew a little saliva on me. The ground painting was made and explained by Xai'im. 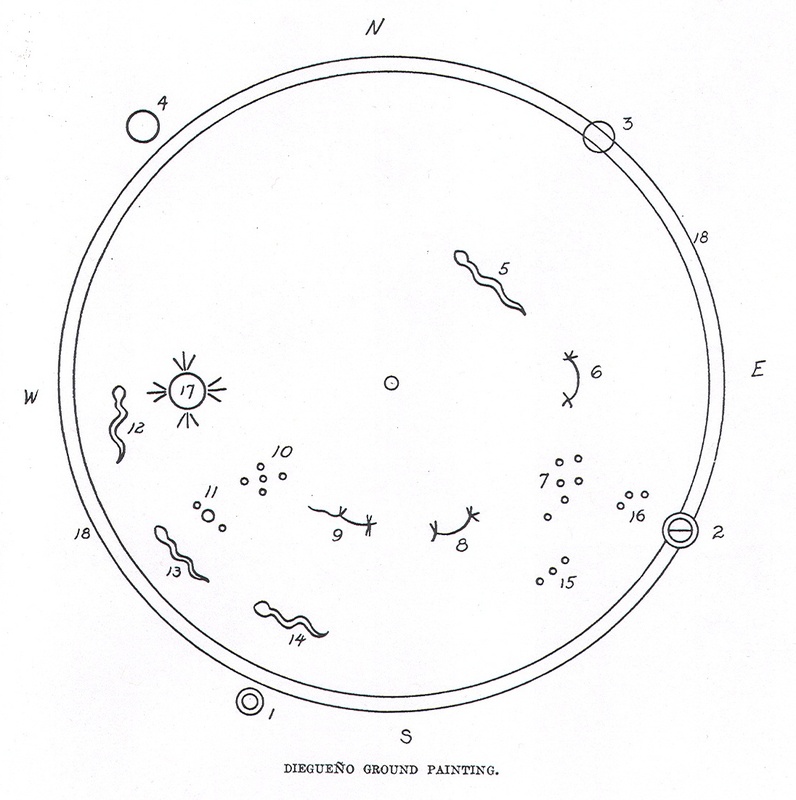 The central figure (a) represented HatotkEu'r, the Milky Way, whose on both sides local geographic features, and the outer figures, the constellations, as follows: (b) Wi'toloi, Viejas Mountain near Descanso, (c) Xiwi' a rock in the ocean near San Diego (the Coronados? ), (d) Wikaiyai', San Jacinto mountain, (g) WikEmu'n, Picacho mountain in Mexico (h) Sahai', a mountain east of Picacho mountain, (i) Xatai' a spring nearby, (j) Pomiyai' Ha'RpE (Pomiyai's a spirit's, entrance?) east of Xatai', (k) Xakwinnyimcop (white water), far east of the Picacho, (l) Ciluk, a constellation (m) Ci'i, the constellation "buzzard", (n) Amu', the constellation "Mountain Sheep," (three stars, perhaps Orion), (o) Koxo'a'p, the jealous star, and (p) Xitca, Pleiedes. The Milky Way was represented by a braided cord of milkweed fiber, for fingers in width. I note that kuchumaa is not mentioned. Ground Painting make by Antonio Maces and Jo Waters, old men at Mesa Grande. Kalmo and Witurt, toloache mortar and pestle. Amut kwaptcurpai, world's edge. There is some doubt as to the correct color for this figure.